We share a lot of images and videos with our friends and family on day to day basis. Most of the time you need to save photos or videos for later access. But to do that you have to follow 3 steps: tap the image/video received in Messages app, tap the menu button in the bottom left corner and then tap “Save Image” to finally save it in the Camera Roll. That’s a bit lengthy process? Isn’t it? You will be happy to know that there is a Cydia tweak that does this all for you. Yes, you don’t have to tap your screen even for single time. MSGAutoSave is a powerful tweak that automatically saves all your SMS/iMessage attachments (pictures/videos) to Photos app just like WhatsApp. Just install the tweak from Cydia and you’re done. Now you might be thinking what if you don’t want to save an image or video. Don’t worry there is an option for that too. 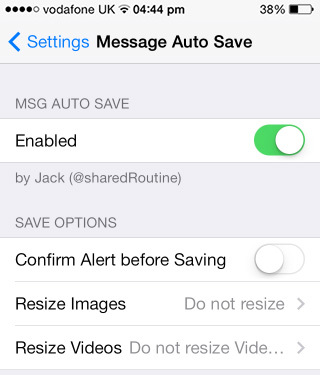 You can enable “Confirm Alert before saving” from the settings menu of the tweak. From now on every time you received an attachment it will confirm whether you want to save the attachment or not. For this process you will need a single tap. The tweak also has the capabilities to resize your images and videos to a selected size before saving them to Camera Roll. Images can be resized from 5% to 95% whereas videos can be resized to 640×480, 960×540, 1280×720, and 1920×1080 resolutions. You can adjust the image and video resize options also from the settings of the tweak. 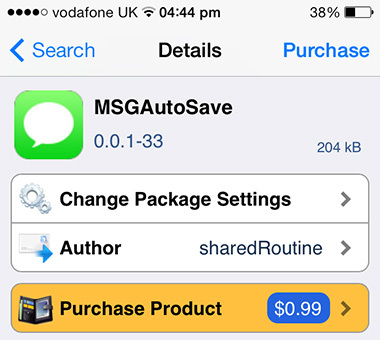 MSGAutoSave is available at Cydia for $0.99, and it supports both iPhone and iPad including the 64-bit devices.